One of the most common problems I find when brought in to commision an AV installation is related to audio wiring. The concept of unbalanced and balanced line connections is actually not that hard to understand for practical use, but I suspect that nobody has really taken the time to explain some of the reasons why you would use one over the other. In a lot of ways we have it the hardest in the Professional AV industry. We are constantly interfacing between consumer and professional gear, and making sure that signal integrity is maintained, you need to know what, why, and how to make connections between equipment. While this does get technical, I find it can help to have at least been exposed to the underlying theory as it gives you more comprehension and can help solve more difficult problems when interconnecting devices. 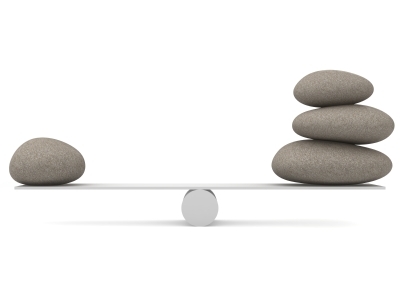 What defines a Balanced Connection? To start with, the term balanced connection is actually incorrect. When you are talking about unbalanced or balanced signalling, you are actually referring to the type of transmission medium, cabling, or “line” as it is referred to in more electronics terms. A Balanced line uses differential signalling (or transformer coupling) to send the same signal down two wires of the same cable. The two signals are completely inverted (or 180 Degrees out of phase). External electromagnetic noise generated between the transmitter and receiver appears exactly the same on each wire. There is circuitry in the receiving side to apply “common mode rejection” and basically block all the noise while passing the signal intact. 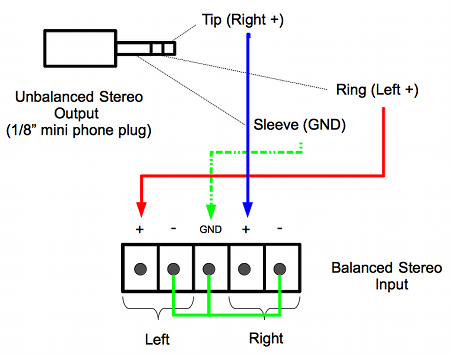 Balanced signalling typically uses a twisted pair type of cable, and the best example would be a microphone cable. Using a balanced line, you can run for hundreds of feet without interference problems. While one of the key features on a balanced line is the differential signalling, it is equally important to note that the impedance of transmitter and receiver are equal. 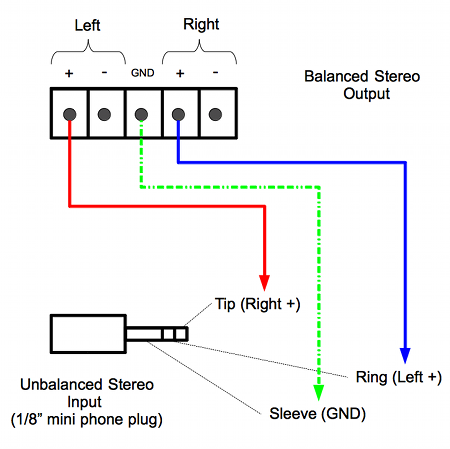 Anything that causes an impedance mismatch will affect the ability of the receiver to reject the noise as the two phase inverted signals may not be inherently identical. What is an Unbalanced Connection? Unbalanced is what you would typically find in your run of the mill 75 ohm coax video cable. The shield is typically wrapped around the conductor and tied to ground which does filter out some electromagnetic noise but just doesn’t do a good enough job for longer runs. So if balanced is so much better, why does anyone use unbalanced connections? The main reason is cost and that is evident by the fact that lower priced consumer gear will have primarily unbalanced connections, while higher priced professional gear has mostly balanced connections. The circuitry required to transmit and receive is not outrageously expensive, but is just not a feature that is worth the added cost for equipment that is designed to connect to other gear with only 3 to 6′ of cabling. Now that we have the theory out of the way, let’s get to some practical application. 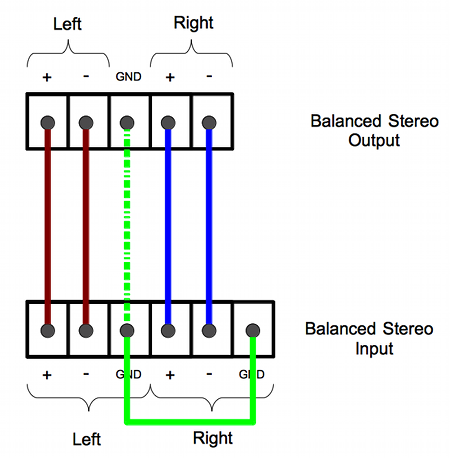 A very typical scenario is a matrix switcher with balanced stereo output and a DSP with balanced mono input. The best way to connect this is to use two channels on the DSP, as summing the channels by connecting right and left together can cause phase cancellation and may also damage the transmitting output circuitry. If you do need to sum the channels into mono, the best way is with a passive summing device such as the RDL TX-J2 or similar. Here are a few other typical scenarios. Note that it is best practice to tie the floating – input on a balanced device to ground if there is nothing connected. This may not be required, but will help prevent the pickup of extraneous noise and ensure the best performance. Tying the negative output to ground is not required on the sending side. Although most of the time you hear about balanced or unbalanced connections the discussion is around audio, you can have any type of signal unbalanced or balanced: video, network, etc. Your typical ethernet connection (10 Base T) is run over twisted pair wiring, and is actually a balanced line. 75 Ohm Coax for video is an unbalanced line. While we are transitioning to a lot more digital video transmission, VGA over Cat 5 is still very popular. This uses baluns or active circuitry to balance each color and sync line of the VGA signal. This allows the unbalanced VGA signal to be balanced and transmitted over balanced twisted pair cabling. I have actually seen people try to bypass the baluns and connect Cat 5 directly to an HD15 VGA connector. PLEASE don’t do this… it does not work. And if by some chance you happen to get very lucky and see a signal, the quality will be horrible due to the impedance mis-smatch that you are introducing into the transmission line. There are likely some more discussions to be had about balanced and unbalanced lines. If you have anything to add, please leave a comment below and let everyone know.